The Holocaust and Human Rights Education Center has the great honor of being the home of Sefer Torah number 140. This Torah is on permanent loan to us from the Memorial Scrolls Trust, located in London. The Sefer Torah #140 was saved in Prague during the Nazi occupation of 1939-1945, where many Torah Scrolls were either stolen or destroyed by Nazi soldiers. This Torah is one of 1,564 Czech Memorial Scrolls taken from the desolate communities of Bohemia and Moravia (what is now the Czech Republic), and were for some time under the control of the Czechoslovak Government. These Scrolls were kept in a derelict synagogue by curators of the Jewish Museum in Prague, until they were moved to the Westminister Synagogue in 1964. 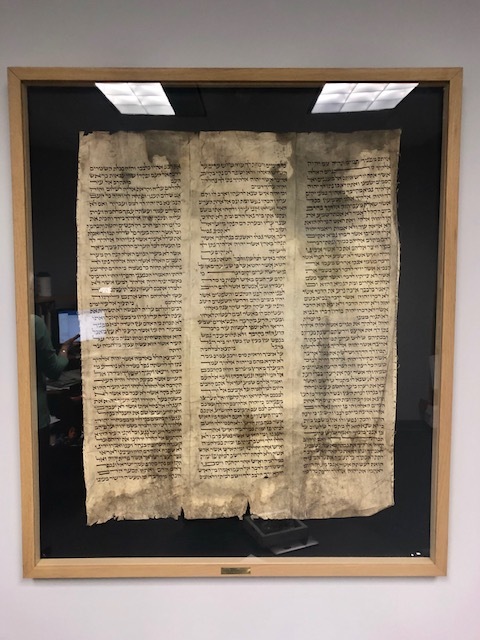 What remains of Sefer Torah #140 is one single page, hence the name “orphan scroll”. You can still see the loose seams on the edge of the delicate paper from the Nazis ripping it out from its original Scroll. The rest of the pages were completely destroyed, ripped up or burned in the Nazis’ attempt to erase all traces of Jewish culture and accomplishment. Our Scroll is unusual due to its orphan nature, however we think it is very special—it is a symbol of unwavering determination to survive in an environment set on destruction.